Diva International has launched a new, even more efficient version of BRAWN UNICO, TRIPLE ACTION. 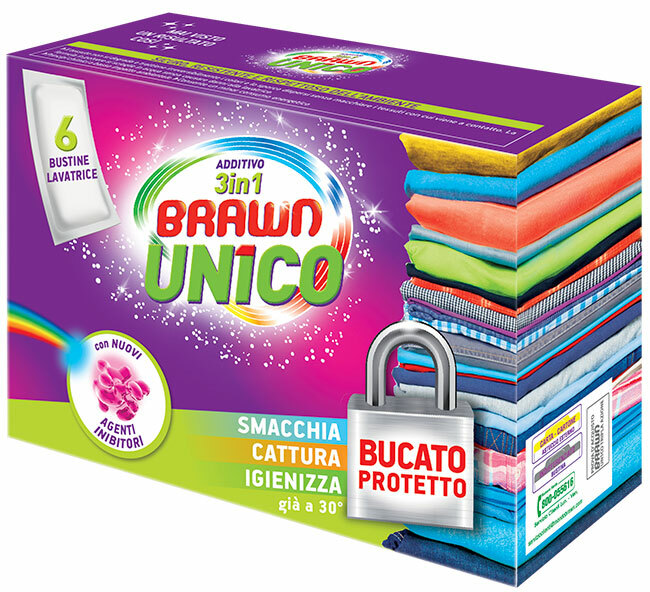 The innovative BRAWN UNICO TRIPLE ACTION sachet, made in fabric able to capture dirt and dyes released in the water, contains an INNOVATIVE ANTIBACTERIAL FORMULA with special active molecules, which not only help clothes maintain their colour, offering longer-lasting brightness, but also act as a filter against colours dissolved in the water, thus preventing washing accidents and the greying of white garments. The stain removal action is performed by powerful stain removal detergents, which thanks to the Active Oxygen, at just 30°C are able to eliminate a broad range of tough stains such as tea, grass, mud, fruit, jam, chocolate, coffee, wine, sauce, make-up, oil and sweat from whites, coloured and mixed garments. subject to the management and coordination of Diva Holding S.r.l. REA PG nr 154826 – Cap. Soc. € 2.440.000,00 i.v.